VSCO Cam is an easy-to-use iPhone cam­era app with ele­gant, min­i­mal pro­cess­ing options. The sleek inter­face and stream­lined work­flow enable you to quick­ly cre­ate beau­ti­ful images to share via major social media out­lets. 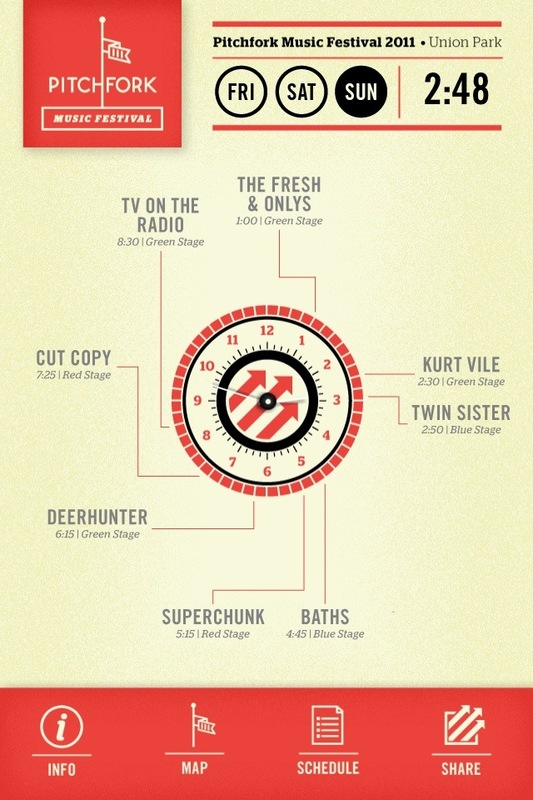 Nice Design on this iPhone App for Pitch­fork Music Fes­ti­val 2011. Though I wish there was a link to-the-top on the Info page. But over­all, sim­ple, read­able and to the point. More screens below. Well, is it? A cou­ple of months old in terms of the video/documentary in this post, but its still rel­e­vant. Prob­a­bly as rel­e­vant years ago when there were a lot of cam­eras to pick from. Any­ways… Lee Mor­ris of Fstoppers.com shoots a full fash­ion pho­tog­ra­phy ses­sion with the iPhone 3Gs. I first heard about ApSci1 through my broth­er Glen recent­ly. Then dug in to take a look on their site for some tunes, http://apsci.net. Lo and behold, they’ve been fea­tured on Wired.com’s Under­wire sec­tion just recent­ly. The arti­cle was about their music video for “Under Con­trol” . They per­formed the track in front of the web­cam and print­ed it up into the hand­held snap­shots that fly by in the globe-hop­ping video, which hop­scotch­es from Brook­lyn to the Grand Canyon, Vegas, Hawaii and Aus­tralia at the speed of sound. They took addi­tion­al shots using the iPhone, then mashed the pro­duc­tion night­mare into an eye-trip­ping visu­al for their body-rock­ing song. In oth­er words, ApSci’s video has no video in it. No post-pro­duc­tion either. Very, very schneaky and cre­ative I must say. Well done. Here’s the video. For those that don’t know, Apple’s WWDC (World­wide Devel­op­ers Con­fer­ence) 2009 was this past Mon­day morn­ing at Moscone West, San Fran­cis­co. It’s pri­mar­i­ly for those devel­op­ing for Apple’s prod­ucts (OS X, iPhone apps, etc.) but it’s also for the Apple fans out there as the Keynote usu­al­ly address­es new prod­uct releas­es, etc. I was tuned in, lis­ten­ing to Ustream’s live stream of the Keynote.1 Pret­ty cool as you can mul­ti­task ver­sus hav­ing to read every new updates on a blog. Though you have to give it up though as the pho­tos on the blog updates are more eye can­dy. You are currently browsing the Just a Memo archives for the 'iphone' tag.